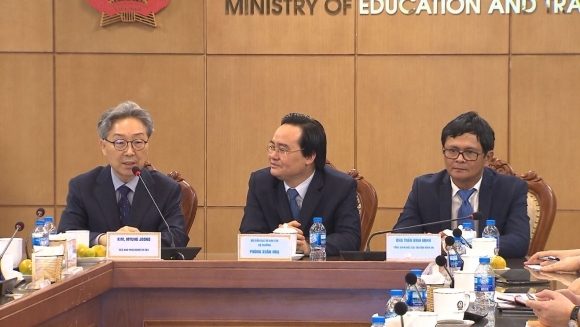 EBS(Korea Educational Broadcasting System) signed a business agreement with Vietnam Ministry of Education and VTV on March 26 to prevent school violence in Vietnam. EBS CEO, Myung-Joong Kim; Vietnam’s Minister of Education, Phùng Xuân Nhạ; and the CEO of Vietnam’s largest national broadcasting company VTV, Trần Bình Minh; were present at the signing. This agreement is an extension of the ‘Korea-Vietnam Television Program Joint Production Treaty’ signed between Korea’s Communications Commission and Vietnam Ministry of Information and Communication on March 25. It is also an outcome of Vietnam’s efforts towards eliminating the recent rise in school violence issues in Vietnam and EBS’ long years of experience in working to prevent school violence. Vietnam values EBS’ expertise in the field of education and its dedication to serving public interests, and hopes to share EBS’ knowledge and experience in production of contents and campaigns related to school violence prevention. The cooperation of the three organizations under the agreement is the first international collaboration to fight against the social issue of school violence. The focus of the business agreement is to prevent school violence and to create healthy learning environments in Vietnam. The details of the agreement include sharing of expertise and experience, hosting seminars and conventions, development of a policy model for school violence prevention, production and sharing of programs and contents, and joint efforts to train professionals related to the issue. EBS has also been successfully running the “Hope in the Classroom” campaign with Worldvision with 1,100 schools and 50,000 students participating in the campaign just last year alone. On his fist overseas trip as the CEO of EBS to Vietnam, Myung-Joong Kim stated, “school violence is everyone’s issue and EBS has been putting in great amount of efforts towards eliminating the issue and will continue to do so by actively sharing EBS’ expertise in school violence prevention and betterment of learning environment with Vietnam”. EBS has also signed an agreement to co-produce “Home, Sweet Home (working title)” with VTV on March 25 as part of ‘Korea-Vietnam Television Program Joint Production Treaty’. EBS and VTV signed a deal with Vietnam’s private enterprise AIC Group (CEO Nguyễn Thị Thanh Nhàn) in 2014 to create Vietnam’s educational broadcasting channel, VTV7. EBS and VTV has continued their ties, ever since, by co-producing a documentary celebrating the twenty-six years of diplomatic relations between Korea and Vietnam and airing program similar to EBS’ documentary “Teacher Makeover”. EBS’ consultation, participation and cooperation in joint productions, and supplying of facilities and equipment to aid AIC’s operation of the channel played a big role in the success of VTV7 established in 2016.